Travel and tourism are two sides of the same cookie. One just tastes a little less processed. Sadly, there are no roller coasters at Angkor Wat. And definitely no air conditioning. But while dripping my way through the masses, I saw an opening and turned. I entered a chamber the size of a childhood bedroom, with few wall carvings. More remarkably, I was the only person there. I stayed in that room, enjoying the chill of being alone amongst many, thinking what the thousands who had existed in that room before me had done, and how they had lived. I left the room, turned another corner, and saw again the tourists. My thoughts turned as well, to my comparison of Angkor Wat and Disney World. Perhaps the difference lie not in the places as much as in the way they were experienced. 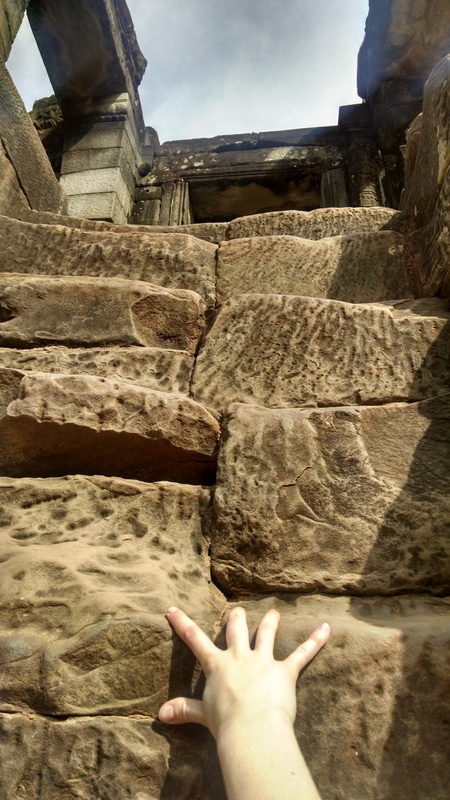 To fully enjoy the temples at Angkor Wat, then, I needed to do a little climbing. Some of you will know that I have a unique desire to climb and explore things that really shouldn’t be. If anyone shares this propensity, I have a bit of advice: go to the temples of Thailand and Cambodia. The guides there actually told me to climb on fallen pieces of the temple as I was looking for a more legitimate exit. And few things have made me happier than channeling my inner Indy to squeeze through broken windows and climb on thousand-year-old temples. At the end of this long day exploring the temples near Siam Reap, my guide suggested I watch the sunset from the top of a temple on top of a hill. Part way up the hill, an official asked me to cover my shoulders. I didn’t have a scarf, so I had to put on a sweater I had in my backpack. I walked quickly up the hill, sweating more than I thought possible, until I reached the top. Once I did, I had to pee. Doing the pee dance while searching for a restroom, I realized nature’s toilet would have to do. I should note that I was wearing harem pants, those diaper pants that MC Hammer made famous in “Can’t Touch This”. As I attempted to gracefully relieve my bladder, I may have misaimed and ‘spilled’ a bit on these ridiculous pants. SO, sweaty, pee-stained, and pissy as a teenager, I climbed to the top of the temple, and sat to watch the view. A Chinese man next to me motioned for me to scoot closer. It became apparent that he wanted to take a picture with me. I obliged. After, he looked at me and exclaimed, “Beautiful!” In case you were wondering, I felt- and was -the farthest from beautiful that I could possibly be. But that didn’t stop me from smiling. Quietly cracking up at the hilarity of the situation, I watched the sun set over the temple. From sweaty and grumpy, to cooler and calmer, I reflected on my mercurial moods. All it took was a little climbing to find my peace. That beats a roller coaster any day! This is the true beauty of travel: getting lost so that you can find something you never knew existed. People will tell you that a jam-packed itinerary while traveling is the best way to see everything. Others insist that eating long meals and seeing one thing a day is better. I won’t be so categorical, but after the past week, I’ve realized what works for me. 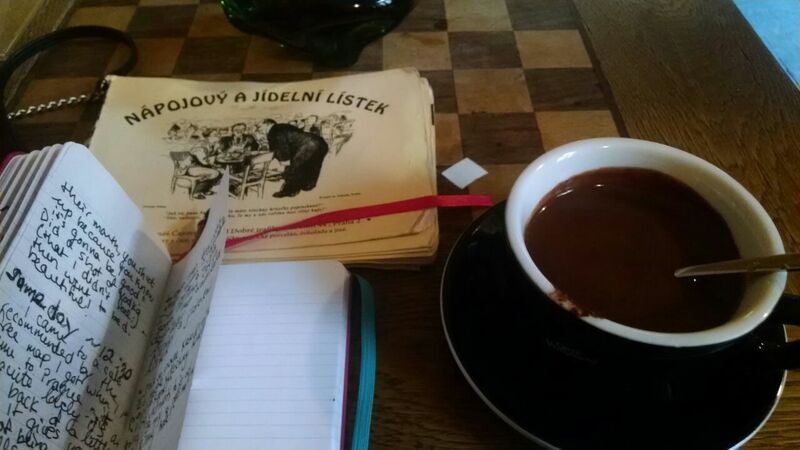 I arrived in Budapest to a hostel full of chatty travelers. I didn’t sleep much in Budapest, but spent much of my time simultaneously getting to know the city and these warm people. In Prague, I spent the days on my own, but the pattern of eating, familiarizing, and wandering stayed the same. It wasn’t until I chanced upon a small courtyard that I realized there was more method to my madness. 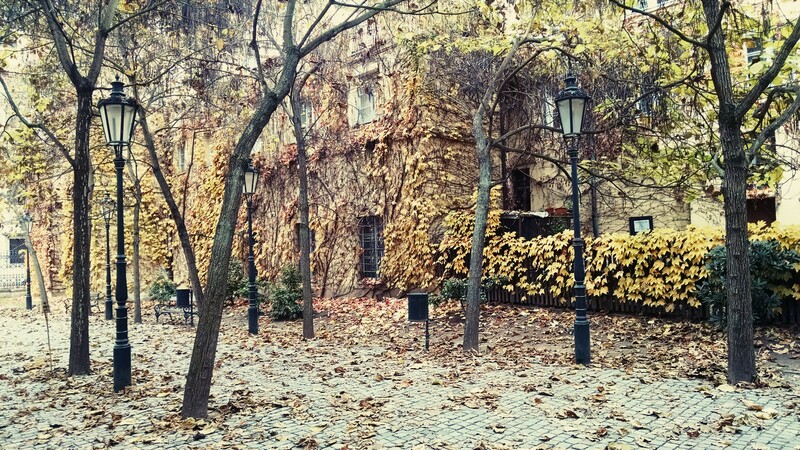 As I was walking to Prague’s Rudolfinum, I looked to my left and saw a little cobblestoned courtyard strewn with fallen leaves and trees preparing for winter. The trees’ branches hung heavy like damp hair, the green, brown, and yellowing leaves obscuring exactly what lay behind. Streetlamps straight from Singin’ in the Rain or Paris in the Belle Epoque guarded the trees. – I have a love affair with streetlamps; they remind me of chilly nights and romantic bridges.- So when my eyes set upon this scene, I really had no choice! I walked into the courtyard and heard a violin playing. One song later a jazz tune floated out from somewhere. Searching for the source of the music, I noticed a set of stairs blocked by a gate. Never one to be deterred, I walked up the stairs and pushed on the gate. It was firmly locked, though not that tall. I could see Prague’s Zahrady Gardens before me. For once, I turned back, mind swimming with thoughts of Babylon, and memories of past travels. I sat in the courtyard for a while, enjoying the kind of view that bears more significance than any insta-captured, filtered, or posted photo. I sat and then, all at once, I left, knowing I would have to return to these gardens… one day. 1. If you fly more than never, get TSA PreCheck. Trust me. 4. When using the flight’s bathroom facilities, remember to multi-task. You can in fact pee and brush your teeth at the same time. This is somewhat disturbing, I concede, but when I remember the sheer number of bowel movements on the plane, I get over it. 5. Keep in mind that others can see your movie selections. To the guy who kept fast-forwarding, then pausing his Scarlett Johansson movie at opportune moments, I saw that. Also, ScarJo can’t feel your finger caressing her lip. I’m judging you, and I’m probably not the only one. 6. Talking to neighbors is tricky. You have to strike that nigh-imperceptible balance between politeness and respecting her/his own time. Good luck, and proceed with caution. 7. If you do want to sleep and have already read step number 2, look for the best way to stretch out without committing the most venal of flight crimes: popping your neighbor’s space bubble. If there are free seats next to you, I recommend a somewhat diagonal corporeal positioning. If you’re limby like me, this is difficult, but COURAGE, ’tis possible! 8. I don’t care how stupid you look, to release the pressure you feel after a flight, follow these steps: close your mouth, pinch your nose, AND BLOW OUT OF YOUR EARS. It works. Just blow. Your ears and head will thank you. 9. Socks are a long flight’s best friend. Post your best flight recommendations below. I can always use more tips!